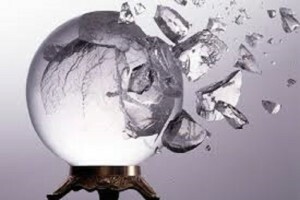 Amid a session with a psychic, some “purported” psychics will give you one future forecast after another. They’ll let you know when you will rejoin with your significant other, when you will land another position, when you will get more cash, and a wide range of things. These psychics love to look into their “crystal ball” and predict to you all the things that will happen to you months or even years from now. Let me ask you though, how does this help you now? Most of the time, when a psychic gives you a bunch of future predictions, they are coming from the philosophy that you are a victim in your life – that everything is just “happening to you” and that the future is all determined by fate. For example, if a psychic tells you that you will meet your soulmate in a year, there is a deeper underlying concept that this psychic is claiming to be true – that no matter what you do, no matter what changes you make in your life, that this is your destiny (meeting this soulmate in a year). How absurd is this? Also, psychics that focus too much on future predictions often do this because they don’t have truly developed psychic abilities. They can’t see all details and factors that really matter, so they tell you things that will happen months or even years down the road. When the time arrives, and you discover the psychic was just making everything up, they are long gone and so is your money. If you’ve seen “The Secret,” if you’ve read “Think And Grow Rich” by Napoleon Hill, “The Power Of Intention” by Wayne Dyer, or any of the other classics relating to manifesting your own reality, you understand that most experiences in our lives aren’t random, we are actually responsible for creating them. Even logically, it’s easy to see how you have a choice in what the future will be. As a simple example, if you stay in your home all the time, if the thought of being in a relationship is disgusting to you, if you don’t expect to ever meet anyone again, then you probably won’t find yourself in a relationship anytime soon. But if you take risks and go to places where you will likely see the type of person you would like to meet, if you visualize yourself in a relationship and convince your subconscious that one is on the way, if you turn the whole process over to your higher power, then guess what – it probably won’t be too long before you meet the right person for you. So you may be asking yourself, if my life is in my own hands, then how can I benefit from a session with a psychic? Just because a psychic doesn’t waste your time with numerous psychic future prediction does not mean that a good psychic can’t assist you. A good psychic will help you to see what specific steps you can take to help you get the results that you want in your life. They can see what the challenges are that you are facing and the options that you have in front of you. I’m not talking about giving you general steps that could apply to anyone. Each person’s life is unique and what needs to be done is going to be different for each person. The factors in your life such as timing, personal desires, personality type, other people involved, past history, and unique talents are different compared to the factors in other people’s lives. And because of these differences, the steps that need to be taken by you will be different. There is no “one plan works for all” when you are dealing with people’s lives. Counselors trained in psychology make this mistake sometimes when trying to help people – I know because I have training and experience in this field. A good psychic can see what unique situation you are dealing with and help you to see the unique path for you to take to get the results that you want. At the end of the session, you should come out with some concrete actions to take, that apply uniquely to your life. If you study metaphysics or even psychology, you will realize that we are participating in whatwe create in our lives largely on an unconscious level. We are doing things unknowingly to draw experiences to us and to push other experiences away. This is true especially when you are dealing with a crisis – our emotions and mental “stuff” tend to block our judgment, understanding, ability to form solutions, among other things. A good psychic can help you understand yourself and your challenges on a deeper level and help you to see options that weren’t clear to you before. The Institute where I received my formal psychic training and the individuals trained through the Institute have worked on projects associated with NASA, the US Military, numerous law enforcement agencies, the United Nations, and many other credible entities. The training I received is a result of over 70 years of international research and it’s based on over 3000 cases studies of individuals involved in our exact training course. And I can tell, from the research that we’ve done, that the future is not cut into stone and that you have an influence over what happens to you in your life. You are participating in what you create in your life on the physical level, emotional level, mental level, and spiritual level. The simple fact that the future can be influenced is the general consensus of all of the credible sources that research these matters. Don’t get me wrong – I’m not knocking future predictions from psychics all together. Sometimes during a session, it’s necessary to give psychic insights into future events. I personally receive numerous follow-up calls from clients validating my predictions weeks, months, and even years after the session. But a future prediction only determines the probability of where a situation is heading, not it’s absolute outcome. Now some things may be pretty tough to change. For example, if you work for a big corporation and there is a merger coming up, there may not be a lot you can do to change this. Or if you are pursuing a romantic partner, and they are 100% committed to someone else that they love, there may not be a lot you can do to influence this (why would you want to anyway)? But I’ll tell you, most situations in your personal life, even involving other people, can be influenced. So on your search for a psychic, someone that can give accurate future predictions is good. But it’s even more important to find a psychic that can help you see what you need to do to change the future so you can get what you desire. And I’m not talking about love spells or charms either, I’m talking about specific steps that you can take on the emotional, mental, physical, and spiritual levels of your life to get what you want. What good is knowing the future if you don’t like it and you can’t change it? Knowing what steps to take to gives you a better chance of getting what you want, this gives you more control over your own destiny – this is a powerful thing. This is much better than just being a victim or an observer on the sidelines. This practical approach saves the time and energy you invest with any psychic.